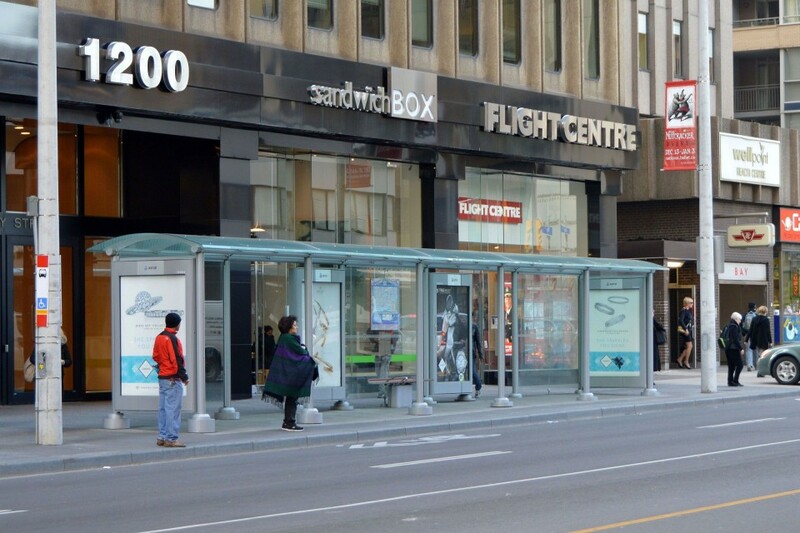 Larger shelters with signature design features like easy-to-understand information, enhanced seating or waiting areas, or landscaping elements improve perceived wait times and general passenger satisfaction. 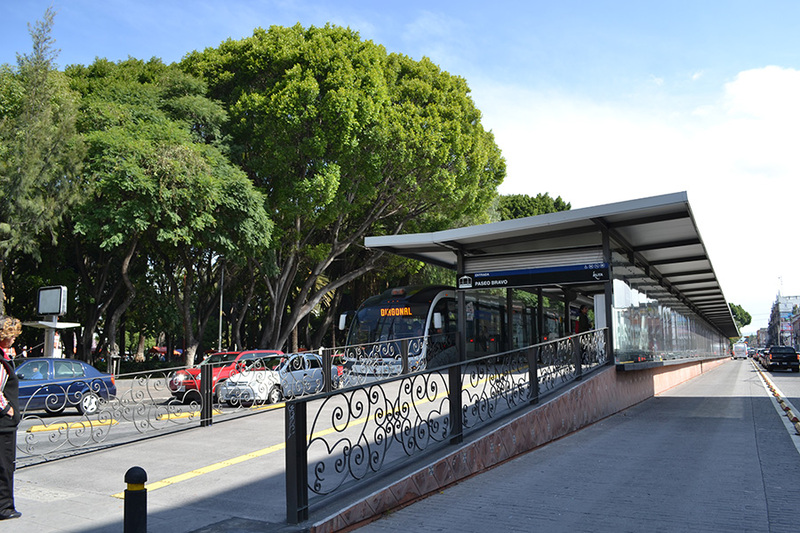 Shelters can give the transit stop a more substantial physical presence in the streetscape, calling attention to the quality of service available. 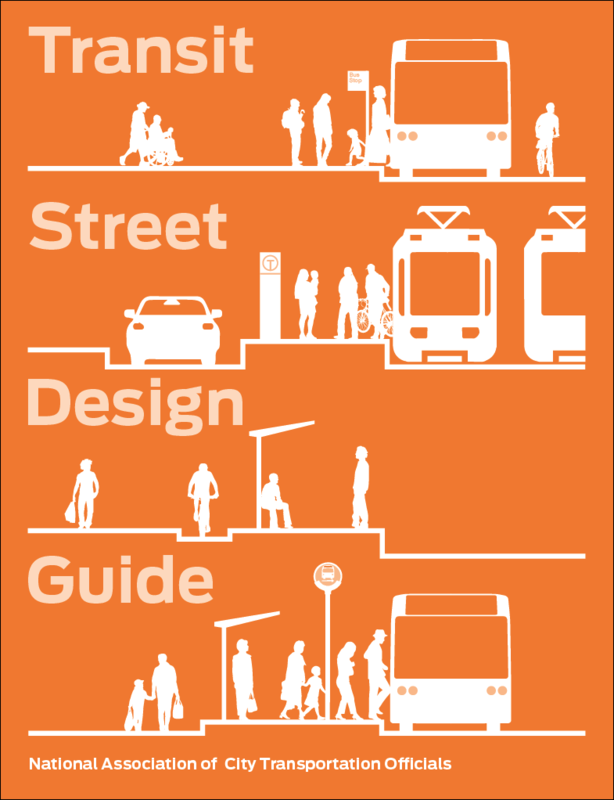 On higher-frequency transit streets, shelter dimensions and amenities should be expanded to meet increased demand. 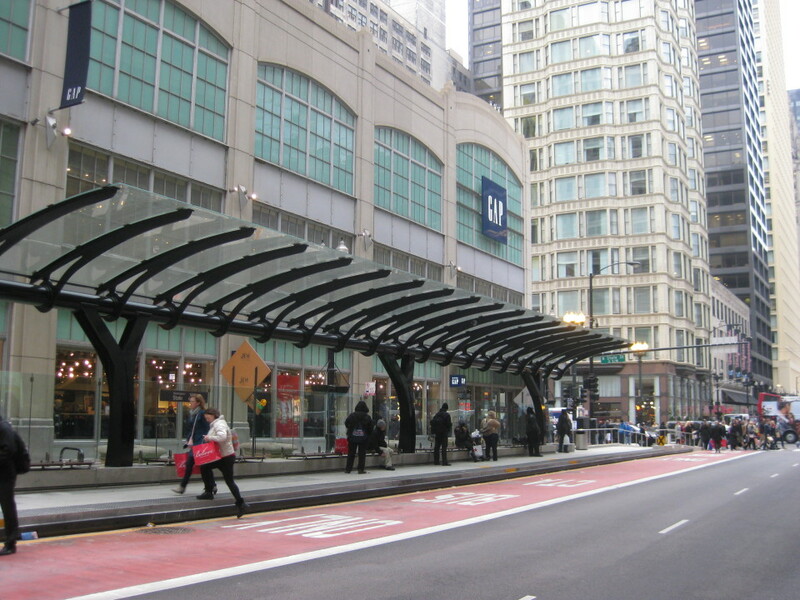 Large shelters are used on higher-frequency or higher-capacity routes, especially stops serving articulated vehicles or multiple vehicles simultaneously, as well as on transit corridors and destination streets, especially where transit placemaking is desired. May serve one or both travel directions, depending on placement. Permeability to the sidewalk is important with longer shelters; consider open designs. On boarding islands, carefully consider pedestrian crossings. Placement of shelters’ supporting posts or walls must not conflict with accessible travel paths, boarding areas, or transit vehicle door zones. 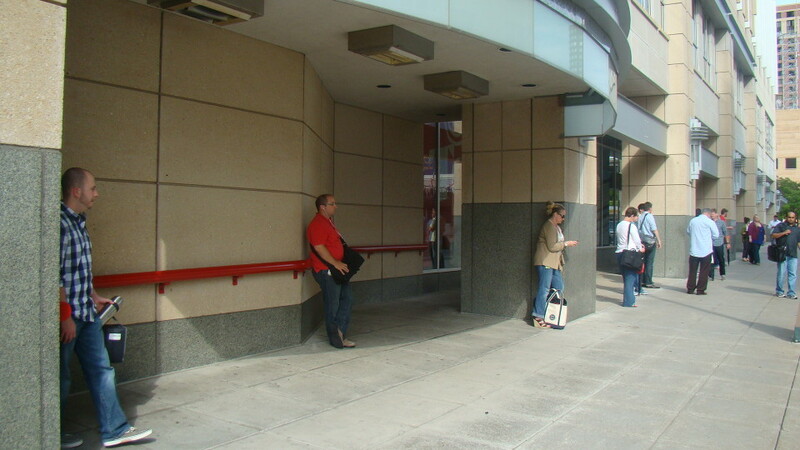 Shelter placement must allow a minimum of 4 feet through-path around all sides when at the level of the sidewalk, and around the front (street) side if elevated on a platform. Use stop ridership data and observed conditions, such as weather, nearby destinations and land uses (e.g. senior centers) to determine level of coverage and capacity. Off-board fare collection and proof-of-payment can be implemented to speed boarding at high-capacity stops, which can reduce per passenger dwell time by half. Ticket vending can be integrated into stop/shelter space. Where New York’s Select Bus Service incorporated PoP fare collection, average per passenger boarding time was reduced to 1.5 seconds. In-lane stops, coupled with off-board fare collection and all-door boarding, reduced average dwell time an estimated 28% on the Bx41 bus in New York, and 38% on the Bx12. Eric Beaton, et al. 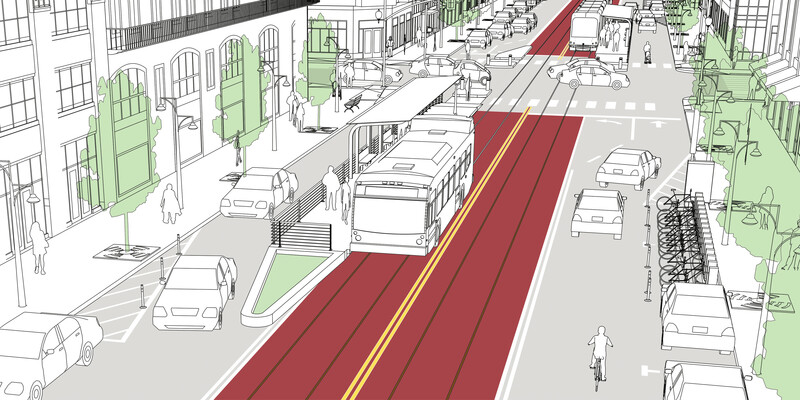 Designing Bus Rapid Transit Facilities for Constrained Urban Arterials: a Case Study of the Webster Avenue BRT Running Way Design Selection Process. Transportation Research Board (2013). Land use characteristics and nearby destinations inform stop design; if significant trip generators are within a quarter-mile, high-amenity shelters are desired. As daily boardings increase, observe queuing volumes to determine length, capacity, and amenities provided at shelters. Real-time displays, either simple LED or full color, communicate multiple routes and up-to-date wait times. 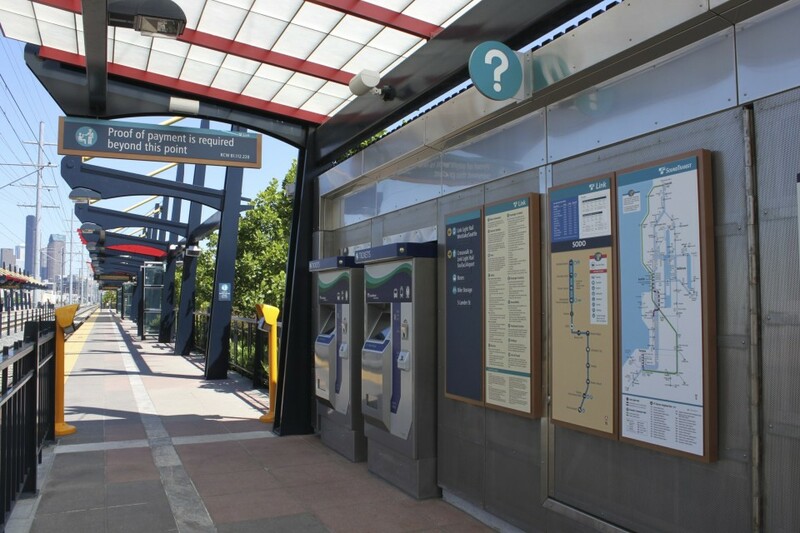 Real-time arrival information increases rider satisfaction. Should include highly-visible signage identifying the station and travel direction(s). System logo and branding should be prominent, reinforcing network presence. Passengers waiting in the shelter must be able to easily see arriving transit vehicles, and passengers must be readily visible to operators if transit vehicles stop only on demand. Include lighting in the shelter, or locate shelters in a well-lit area. Ensure the shelter can be seen from outside by using glass or open design for the back wall. Typically physically separated from pedestrian through paths, usually on boarding islands with raised platforms. 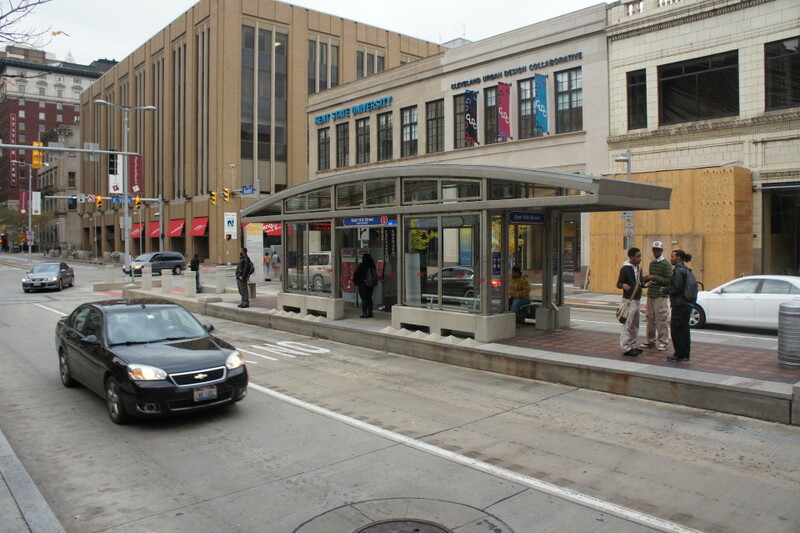 Shelters can be oriented open to curb (typical); back towards the curb; at the building-side of the sidewalk; or integrated into a building facade. 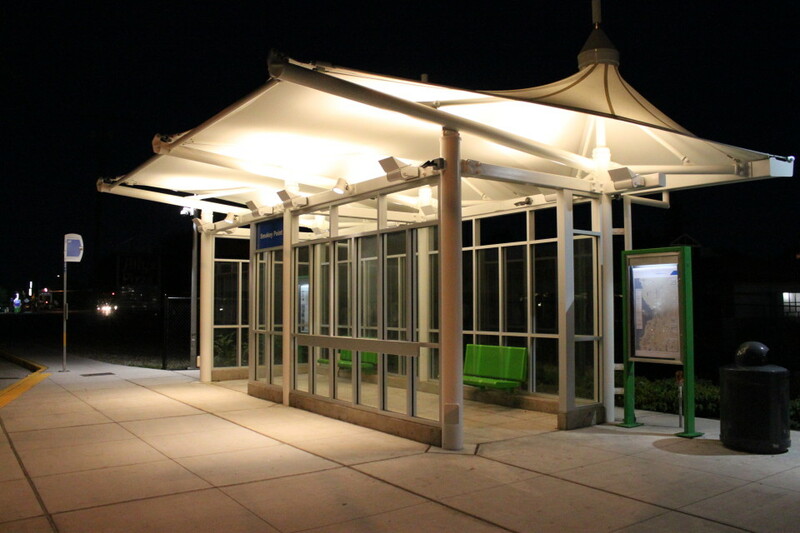 The pitch and location of shelter roofs must account for precipitation, preventing the roof drip line from falling onto passengers between the shelter and the transit vehicle. Roofs may be extended slightly over a transitway to prevent rainfall at the door. Social safety is a primary consideration at shelters. Use transparent materials to enhance visibility of waiting passengers. Include trash bins, especially at high-volume stops. Ensure a maintenance plan is in place. Trash receptacles may include aperatures or solar compaction capability, based on pedestrian traffic and safety considerations. Avoid placing receptacles blocking access paths, near critical structures, or in enclosed alcoves and alleyways. Collection, visibility, and maintenance are key considerations. Bill Pitard, Sean Ryan, and Randy Clarke. Trash and Recycling Receptacles for Transit Facilities. American Public Transportation Association (2013). Consider climate in both design and materials selection; metals should be covered in a hot climate. In cold, snowy, or harsh climates, enclosed shelters provide additional weather protection. Provide opportunities for placemaking, especially by integrating public art or amenities. At stops or stations with high ridership or long queues, larger station enclosures with more seating provide a higher level of passenger comfort and indicate the importance of the station. 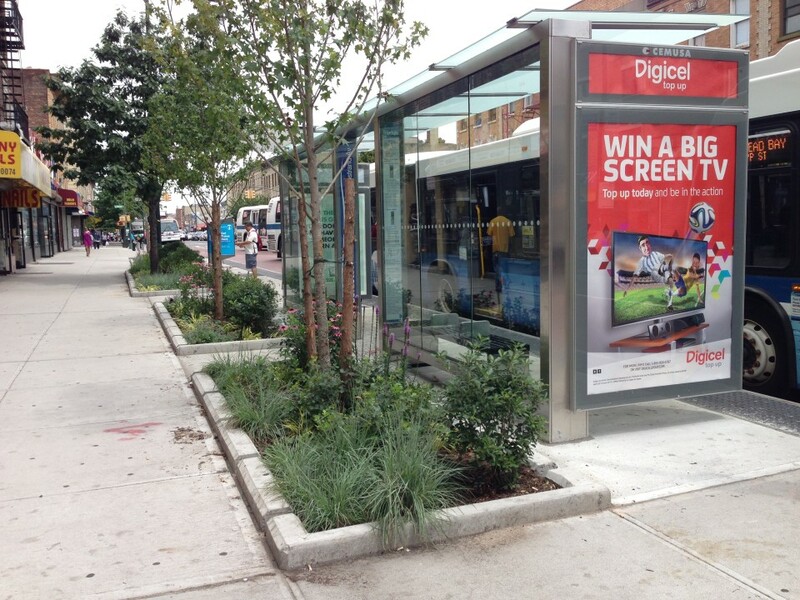 Due to limited sightlines, enclosed shelters should only be used on routes where transit vehicles make all stops. Heating or lighting may be provided within enclosures to increase comfort. Enclosures may be provided in collaboration with abutting buildings and structures, such as retail or commercial facilities. Environmental controls within transit shelters shall be proximity-actuated. (ADA Std. §R308.2). References for Large Transit Shelter: 1 found.